Olan is a non-spicy dish with a coconut milk curry base and its major ingredients being Black-eyed beans, pumpkin, and green chillies. Although it commonly appears in white, it can also be made in a slight brown coloured prep. Olan is a recipe that is mandatory in every Sadya and it is so for Vishu 2019 as well. This is an exclusive recipe for the people who love tangy flavours. Rasam is a dish that can be made in many ways like tangy, spicy, etc and much more. Tamarind Rasam can add the extra touch of tanginess and spiciness to your Vishu 2019. Pachadi is a sour curd based dish and can be made into varieties depending on flavours. Some of the common Pachadi flavours are Beetroot, raw mango, Bitter gourd and much more. Make this Vishu 2019 fabulous with a colourful Beetroot Pachadi. ‘Naranga Achaar’ typically means lemon pickle. With its sour and spicy flavour, it is all set to add fire in your mouth. Vishu 2019 cannot be any more grandeur! This is a fried and healthy dish made of long beans. It is the perfect side dish for a curry like Sambhar. Add some healthy note to Vishu 2019 with this dish. This Vishu 2019, Masala Box brings you authentic homemade Vishu Sadya to your doorsteps. With our specially curated Sadhya, you can now easily make a party food order or a bulk order of Sadhyas by pre-booking. Our home chefs bring to you some of their best masterpieces in the form of a Sadya with dishes like Manga curry, Naranga curry, Pachadi, Chena Mezhukkupurutti, Moru Kachiyathu, Pappadam, ghee, Inji Thayir, Upperi and much more. 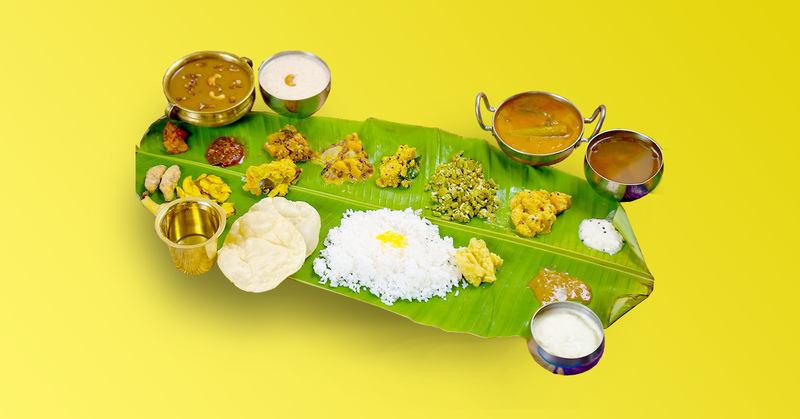 Indulge in the best homemade Vishu Sadya in town! Author Neeta VijaykumarPosted on April 5, 2019 Categories UncategorizedTags bangalore, healthy, homemade, kochi, Masalabox, sadya, vishu, Vishu 2019, Vishu SadhyaLeave a comment on A leaf Licking good experience with these Top 5 Vishu Sadya recipes!